Should children watch sad movies? - Who's the Mummy? Do you let your children watch sad films? It occurred to me, as I was enjoying a moment of high culture last night, and watching Terminator 3, that films where nobody dies are significantly less fun, somehow. Honestly, who wants to see Arnie blow up a car filled with people and then see the text: HUMAN CASUALTIES: 0 on the bottom of the screen? Similarly, I rolled my eyes a LOT when I read a review of The Hunger Games in one of the papers this week that was criticizing the book for being too violent for 13 year olds to see. I’m not sure what the reviewer expected – The Hunger Games is a story about 24 children who fight each other to the death so it’s not THAT surprising it’s a bit violent. But having watched the film myself at the cinema this weekend, there’s no gore at all, very little in the way of blood and the documentary-style handheld camera work means viewers see very little of the violence – it’s just an impression. And the film itself is just brilliant, it really is. Obviously, I’m not about to sit Flea down in front of The Hunger Games but I do think it’s important to let children see films that depict death, or violence, or sadness. I tend to think stories like this provoke conversations, and allow children to explore difficult feelings and concepts in a ‘safe’ way – I’m not interested in only letting Flea see sanitized stories where everyone ends up friends, and nobody gets hurt. Because life’s not like that. It’s one of the reasons why I chose to watch The NeverEnding Story with Flea for this month’s Tots100 Film Club. 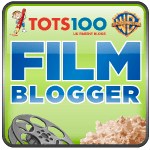 As a Film Club reviewer, I get sent a family film to watch with Flea each month, and recommend it (or not) to other bloggers. Here’s the thing about The NeverEnding Story – it gets really, really sad. In some ways, the film is a classic children’s adventure story. A boy is swept into an alternate world of magical creatures, where he embarks on a quest. There’s some top 80s music (if loving Limahl is wrong, I don’t want to be right) and some really nice story-telling. But there’s one scene in the movie where, if this was a typical kids’ movie, things would turn out okay and success grabbed from the jaws of defeat. But in this case, it doesn’t happen. It ends really badly, and people are very sad as a result. Flea cried buckets. And then asked to watch the film again, and again. It’s one of her favourite films, and one of the few I’m happy to sit and watch with her – and I’m a sucker for a movie that tells kids how important books and imagination are. I think it’s pretty healthy for children to watch the odd sad or scary film, but what do you reckon? Can children love a tear-jerker just as much as adults, or are they just likely to be upset? What sort of things wouldn’t you let your children watch? Next Post Will you be buying petrol tomorrow? Bridge to Terebithia is a fantastic children’s movie, I think, but yes – very moving! Gory violence is definitely a no-no, but there has to be a balance in what they watch and experience because it’s basically a way of preparing to experience things in real life. Ironically though, when the pet rabbit died it was me that was the most upset, and the boy was fine with just asking plenty of questions about death and heaven etc. The only thing that always surprises me is when I read the non-Disney version of fairytales and remember exactly how gory they really are. Yes, I think the things we watched as kids were equally scary and sad and gory in some cases, albeit in a different way. I think sad is OK , within reason (not quite sure what that means quite – I would just go on gut reaction, knowing the individual child). But scary and violent is not so OK. That probably reflects my own comfort zones. I can’t bear really scary thrillers or horror. Never have done. It gets harder as your child gets older. It’s OK to protect them from scary and violent stuff when they’re Flea’s age, but you wouldn’t want your son to be the 16 year old who’s still on Bob the Builder when all his friends are going to the latest James Bond. I tend to think it depends on the child too – some children really like being scared within safe boundaries, while others would be traumatised. Flea’s a bit more of the former, she loves rollercoasters and monsters and the whole playing at being scared thing. Drama queen, basically. The Neverending Story does work out in the end tho – even Atreyu and his mud-sunk pony return renewed thru Bastians imagination – I love this film far too much for a woman of my age! 🙂 We watch some fairly gut wrenching documentaries – especially the animal rescue ones and Ty with his extreme home makeovers is always good for a sob. I couldn’t watch Ty when I was pregnant because it would render me insensible for an entire day. I agree, it’s vital that children see age appropriate films that depict conflict, death etc to enable them to deal with the realities and hardships of life. I remember watching Bambi aged 4 and how it affected me but was a safe way to discuss issues with my parents. Yes, I think watching things in that safe place makes kids able to deal with much more than we might imagine. And it appears that starts young: I was absolutely astonished (and maybe a little heartbroken) so see A and S (aged just 3) tears rolling down their faces at the Lion King. It had honestly never occurred to me that they’d understand what was going on, or be affected by it. Of course, now it’s all they want to watch, so I think you may be right about them enjoying a tear jerker, just as much as their mum does. And scary – how young is too young for Chitty Chitty Bang Bang? We have it, but I have been putting it off… Thoughts? Oh, you don’t want to know the long list of not very sad films that make me cry. I’m such a wuss. Flea wasn’t scared of Chitty Chitty Bang Bang. Tough as nails, that kid, I tell you. I remember watching Lassie with my youngest when he was aged five – many years ago now. Towards the end of the programme he was in floods of tears – the outcome for poor Lassie didn’t look promising (but then it never did, did it?). Although we should have been rushing out of the house to pick up his brothers we sat and watched until the bitter end and there was the predictable happy ending. I always felt I’d done the right thing then – it never crossed my mind that I was shielding my little one from the fact that in this life s**t happens and Lassie style happy endings are not always the case. Incidently he was the only one of my boys who seemed affected by ‘sad’ – so horses for courses perhaps. Hey Buddy!, I found this information for you: "Should children watch sad movies?". Here is the website link: https://www.whosthemummy.co.uk/should-children-watch-sad-movies/. Thank you.